Hi all! 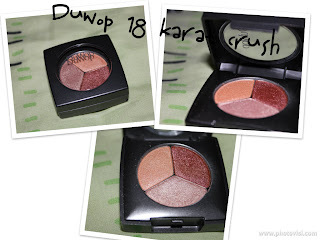 Months ago, I've won a Duwop Crush eyeshadow trio from Luxola.com, an online store that brings in the brands which Singapore doesn't carry- Duwop, Face Atelier, By Terry, etc. This was my first ever Duwop product which I've owned and I'm very excited to swatch it after I've got it from the friendly Luxola office! "This luxurious trio of golden talc-free shadows has the look and feel of crushed velvet with a metallic shimmer. The convenient compact contains a light taupe, peachy beige and rosy bronze that can be combined for endless looks. Apply lightly for a hint of shimmer or layer and mix for a more intense creamy look. The powder formula is paraben free, sulphate free, petro-chemical free, fragrance free, free of pthalates, no GMO’s, no PPG’s, no MEA, DEA, TEA’s, formaldehyde free, and triclosan free. 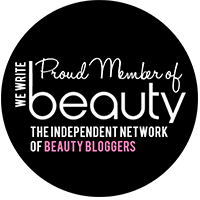 DuWop never uses animal testing on any of their products." 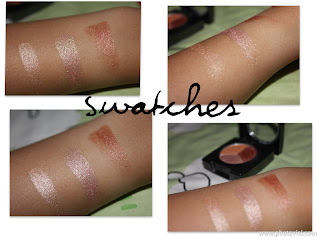 The eyeshadows are super pigmented and creamy, even though they're talc free. I'm not sure if this is a pigment-kind-of-eyeshadow trio, but the colours are really pretty and I couldn't resist to do a look for my friend on one of the performance days. The colours on the trio gave me a strong-yet-gentle kind of texture, not exactly that kind of heavy metal. She loved the look which I've done for her!